The old saying "one bad apple spoils the bunch" holds especially true for company culture. Keeping around any employee who is a bad culture fit can destroy your team's working environment. If people think bad or counterproductive behavior is acceptable they will imprint on this and either start acting badly themselves or want to leave the company to work in a more positive environment. The Jerk may be an incredibly effective and productive member of your team. Unfortunately they are also multiple of the following: prickly, arrogant, mean, dickish, short tempered, needlessly and constantly overly confrontational, credit mongering. Even if they are productive in their own rite, they make the working environment hellish for the people around them and must go. The Whiner always point out the negatives in every situation. When the team accomplishes a great goal the Whiner points out all the bad parts of accomplishing the goal. You do not want people on your team who are mindlessly positive. However, ongoing negativity can really detract from the team environment. Even worse, whining has a tendency to spread and your culture can flip to a "we can accomplish anything" mindset to one of massive whining and defeatism. This person will take credit for others people work openly and unapologetically. They will claim all the best ideas as their own and quickly disown or pawn off anything they came up with that did not work. This creates two problems: (a) the Credit Taker gets promoted or otherwise rewarded inappropriately and (b) the people who really deserve the credit and rewards don't get them. Like the Whiner, the Credit Taker's behavior will get emulated if rewarded or not addressed early. Everyone loves this person. They are fun, charming, and great at presenting stuff. They always have an interesting idea or story. Unfortunately, they don't actually get anything done, and in some cases pawn off work they are supposed to be doing on others. All their energy and enthusiasm can make it seem like they are making great things happen (especially to the VP leading their overall group a few layers up in the organization), but really they spend most of their time shmoozing other people and reading news online. Keeping this sort of person around signals to the team that charm matters more then substance and a lack of execution will be overlooked or even rewarded. a. Mediocre people are promoted and rewarded. They then have a larger voice in your company overall including company directions and hiring decisions. b. People learn to be rewarded for optimizing for the success of their Loyalty Monger manager over the success of the company (since it is their manager who provides them with rewards rather then the company). This leads to behavior that does not put the company first. It is sometimes hard to catch the Loyalty Monger as CEO as a 360 review yields lots of positive reviews from the people who have been improperly rewarded by them. The way to ferret them out is to watch who leaves their group. Often highly talented people focused on doing good for the company will do poorly under the Loyalty Monger. Similarly, if the Loyalty Monger's top lieutenants get bad reviews from their peers (e.g. a product manager reviewed poorly by all the engineers and designers they work with) that may be a sign of a Loyalty Monger in your ranks. 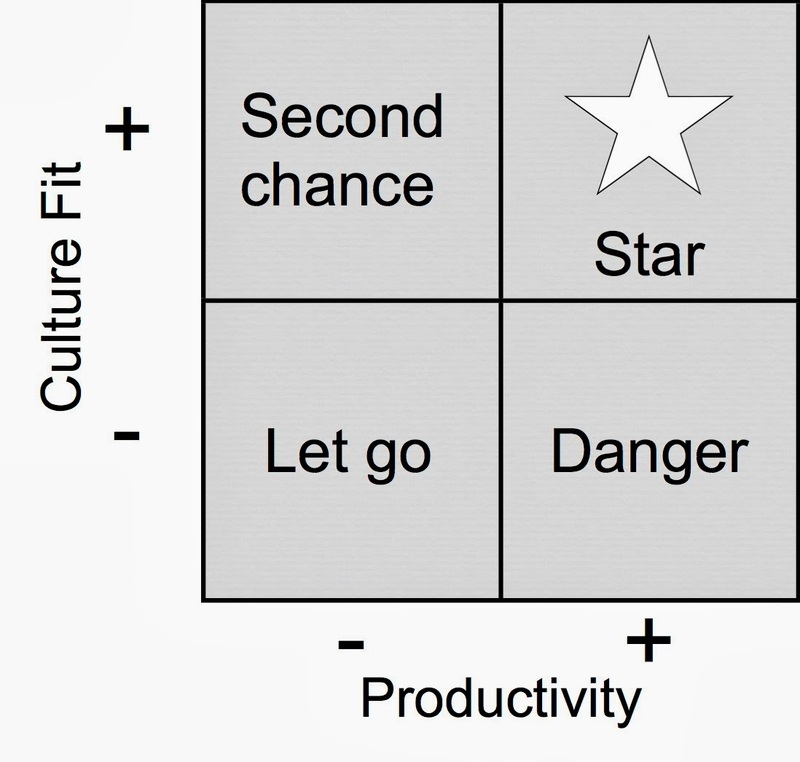 Jack Welch used to use a 2X2 matrix at GE to classify his employees. High Culture Fit, High Productivity. These are your Stars. Do whatever you can to promote, develop, and find more of these people. High Culture Fit, Low Productivity. Give these people a second chance due to culture fit. If they can not become productive, you will need to let them go. Low Culture Fit, Low Productivity. Let them go quickly. The lack of culture fit is the reason they should not be given a second chance. Low Culture Fit, High Productivity. These people are dangerous to your company long term. For most managers, the hardest people to decide what to do with are the people who are very productive, but a bad culture fit. As a manager you will be tempted to keep them around or even reward them, even though they make the lives of the people around them miserable. However, you should do the exact opposite and let them go quickly. These are the people pose the largest threat to your culture by providing bad behavior for others to copy. Additionally, they will hurt your culture by driving out their most productive and well intentioned peers. With culture fit, you should never compromise. This bar should be the highest for the most visible and most productive of your team. In some cases, people complain a lot if they are overloaded or legitimately concerned about something. In this case, as their manager you should ask why they are so unhappy/negative. If it is work load or other issues, this is often fixable and a Whiner can be turned into a more upbeat and positive contributor. One person I eventually worked with at Google claimed they "founded" the mobile team at Google on their resume/LinkedIn until recently, even though they joined the team when it had ~15 people. This is akin to joining Dropbox at 15 people and claiming you co-founded it. I never thought I would ever quote Jack Welch.